Lock in a great price for The Magnolia Hotel – rated 8.7 by recent guests! Outdoor spaces have a very cool "retro Miami" design to them. Pool area is nice and relaxing, the hotel also has a cool spa. Staff is very polite. Good breakfast. breakfast was excellent, rooms were small but perfectly suited for our stay, staff were friendly and helpful, spa facilities and the gym and chill room and film room were really good, hotel was clean throughout, we will definitely return oh and location is perfect for the area. Very modern and comfortable rooms. Great staff and the omelettes at breakfast are lovely. Amazing breakfast (and food overall) Very clean and tidy. Staff were friendly. Will 100% be going back. The staff were extremely helpful and the hotel was very relaxing. Everything! Staff in particular were fabulous! The facilities were great, rooms were lovely and clean. The whole place had a very calm and relaxed vibe! We will be back! Manager, Mark and all staff interested and caring efficient and warm.my wife needed gluten free products and the restaurant staff were most helpful. Great location for Quinta do Lago and the free breakfast was welcome. The main building is lovely and has a great design. The heated pool is a good idea and the gym is quite good. The price is also reasonable. The Magnolia Hotel This rating is a reflection of how the property compares to the industry standard when it comes to price, facilities and services available. It's based on a self-evaluation by the property. Use this rating to help choose your stay! 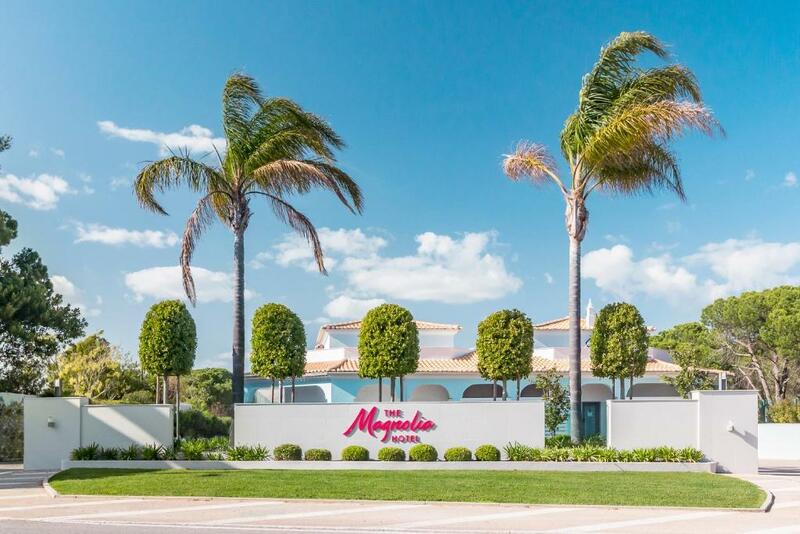 One of our top picks in Quinta do Lago.Located in the surroundings of the prime golf destination of Quinta do Lago, The Magnolia Hotel features an outdoor pool, free WiFi and is just 2.5 mi from Garrão Beach. Rooms have a modern décor and are equipped with air conditioning, a satellite TV and a balcony. Some rooms include a safety deposit box. Bathrooms come with free toiletries and hairdryer. In addition, the property features 7 tastefully decorated cottages with a rustic style. The on-site hotel restaurant features a hint of beer in every dish and the Lounge Bar offers a modern ambiance where guests may enjoy craft beers and relax. In addition, The Magnolia Hotel features a tennis court and free parking on-site. Golf enthusiasts will find Quinta do Lago’s North, South and Laranjal Golf Courses within 1.9 mi and Faro International Airport is just a 5-minute drive away. When would you like to stay at The Magnolia Hotel? This holiday home has a balcony and air conditioning. House Rules The Magnolia Hotel takes special requests – add in the next step! The Magnolia Hotel accepts these cards and reserves the right to temporarily hold an amount prior to arrival. Rooms can be noisy, you can hear people walking up the outside stairs to the room and every conversation in corridors to the point you think they are in the room with you however it was quiet at night and I am a light sleeper and slept really well! Location wise it is far out from a lot of the other restaurants! But we used Uber which was handy! Inability to walk from the hotel due to lack of footpaths. Staff were very helpful Room was a bit small. The rooms are what let it down. They are refurbished from the old hotel that was there and you can tell. Fixtures and fittings are very poor quality and flimsy. The rooms are very small and have no sound proofing at all. You can hear everything next door and from the corridor. It would be a nightmare if you were stuck near a stag or hen party (one of which arrived just as we were packing to go and the noise from them through the walls at 11am was horrendous so we were delighted to be leaving. Imagine that at 2am!). The bed is fine but that is the only positive thing I can say about the room. The bathroom products were also cheap and nasty. Forget using the shampoo if you have long hair and the body lotion was like water. The staff were a little disorganised. Friendly but not 'on the ball' and service at the bar was very slow. Stayed in one of the two bedroom cottages.We liked that it was spotlessly clean.Both beds were extra comfy.Breakfast was delicious.Staff were friendly and very helpful..booking taxis for us and ensuring we had everything we needed..a great trip! The bathroom's are a little cramped but otherwise great rooms and hotel! Very friendly hotel with comfortable rooms. Comfy bed, lovely clean facilities and helpful staff. Would have liked a mirror near the socket where I was plugging in hairdryer . It was convenient for us! The staff were v pleasant and helpful. Only mirror in the room is next to the door- and plugs don't reach. You therefore need a mirror on the desk to be able to get ready. Breakfast is delicious- however very confusing. The staff need to sell the hot meals and explain what is available. Or get some menus printed explaining you can have buffet or order from the staff. Staff are very welcoming. Refurb of the pool, restaraunt and lobby looked great. Rooms are clean and simple. Food is fantastic and overall value for money is great at this hotel. A special offer in early Nov. made it worth the money, more than I might otherwise spend on a hotel near Faro.